Oscar winner Kenneth Lonergan’s Pulitzer-finalist play The Waverly Gallery is now playing at the Golden Theater. Lila Neugebauer directs a cast led by Oscar nominees Elaine May and Lucas Hedges, Tony winner Joan Allen and Tony nominee Michael Cera. 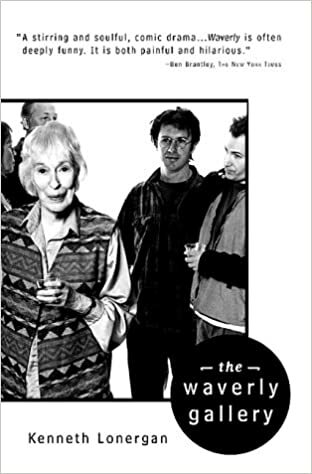 The Waverly Gallery is about the final years of a generous, chatty and feisty grandmother’s final battle against Alzheimer’s disease. Gladys is an old-school lefty and social activist and longtime owner of a small art gallery in Greenwich Village. The play explores her fight to retain her independence and the subsequent effect of her decline on her family, especially her grandson. The Waverly Gallery is a memory play, which is a solid dark irony for a story of memory loss. In the first scene, Daniel (Lucas Hedges)—our narrator and a surrogate for playwright Kenneth Lonergan—listens with slight irritation as his loquacious octogenarian grandmother, Gladys (Elaine May), natters on about people they know. He’s clearly heard a lot of this stuff before, and soon, so have we: Once an intellectually engaged left-wing political activist, Gladys is sliding deeper and deeper into dementia. She repeats herself, she forgets herself, she loses herself bit by bit. The disease robs her of personhood; as the play creeps forward, she moves from being an irritation to a source of worry and, finally, a terrifying burden. Spending time with Gladys isn’t easy for her family—especially her necessarily patient daughter, Ellen (a wonderfully contained Joan Allen), and Ellen’s blunt husband, Howard (David Cromer)—or for the audience. First staged in 1999, the play has little plot except for what is, perhaps, the default plot of life: the inexorable decay of something into nothing. For two hours, The Waverly Gallery forces us to deal with the walking memento mori that Gladys has become, but in a way that never seems cruel. Infuriating though she often is, it’s impossible to hate her, and the casting of May, in her return to the Broadway stage after more than half a century, works brilliantly. She is funny and warm, and she’s familiar, which helps fill in some of the play’s emotional blanks: Our affection and respect for this titan of American comedy spills over into how we respond to her character. May receives very fine support from the rest of the ensemble of Lila Neugebauer’s steady and unforced revival, which also includes Michael Cera in a vanity-free performance as Don, an aspiring artist who is drawn into Gladys’s orbit. She runs a storefront gallery in Greenwich Village, and he is excited to exhibit his work there, not realizing the extent of her impairment. In a way, Don is a stand-in for Lonergan, too. The pride he takes in his paintings is connected to the labor he has put into capturing the small details of subjects that are meaningful to him, preserving loved ones and loved places in artistic amber. The Waverly Gallery feels similarly personal. During scene changes, we hear delicate original music by Gabriel Kahane as old videos of New York are projected onstage: vibrant street scenes that erode before our eyes. In this moving play, one gets a sense of Lonergan committing his family history to the record, making hard truth into beauty, so it doesn’t just disappear.